Wrestling icons The Undertaker and Triple H will face each other one more time at WWE Super Show-Down in Melbourne, Australia. In case you couldn't tell by the match's rather on-the-nose tagline, it will be the final time that the legends will do battle with each other. The match's inclusion on the huge event's card certainly divided the WWE Universe. On one hand, it will be incredibly intriguing to see how a modern-day clash between these two grizzled veterans will compare to some of their previous classics while, on the other hand, it risks damaging their incredible history - especially the beautiful ending that it already had. Speaking of that perfect ending, WWE has had to fabricate a number of stories in order to defend its controversial decision to resurrect the feud, leading to the company suggesting that the two have "unfinished business" with each other (when they clearly don't). 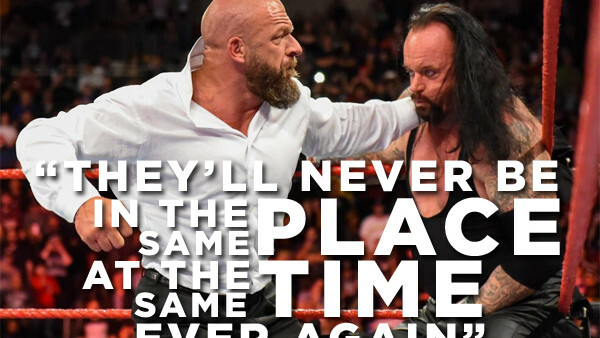 This isn't the first time that the WWE creative team have altered this pair's past to fit the narrative they are trying to portray, so it wouldn't be surprising if the "last time ever" wasn't actually the final time they meet in the ring.